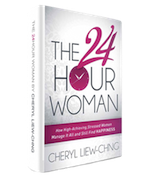 The 24-Hour Woman - thrive in what we do and live the life we love. The 24-Hour Woman was founded on the belief that women who know who they are and what they want can engage in the joys and vibrancy of life. The24HourWoman.com platform is designed to help women all across the globe to consciously design and transform the way they live and work so they thrive in life—whether as women leaders or those seeking a healthier work-life balance. Headquartered in Singapore (Asia), The24HourWoman.com platform is uniquely positioned to reach and engage women in both the East and West with leadership seminars and support. Recent demographic, social, and economic trends have created amazing new career and business opportunities for women. While this is wonderful for women, it also presents significant challenges for individuals, businesses, families, and communities. Empowering women for greater success in work, business, family and personal effectiveness…. in areas that matters. The only way women can thrive amidst these changes is by tuning into their authentic selves. The 24-Hour Woman inspires women to embrace a vision of excellent living wherein they win both in career and life arenas. Our programs include a variety of live and virtual events, products, mentoring, and community-building activities amongst like-minded individuals who also desire vibrant and fulfilling lives. Our approach and programs are built for you to THRIVE as women in business and life. Cheryl Liew-Chng is an in-demand international speaker, trainer, coach, and CEO/Founder of LifeWorkz—an Asian-based firm whose mission is to guide individuals in more effectively creating, redesigning, and transitioning to “lives most excellent.” Having served in leadership positions and navigated several career transitions in many industries—while also attending graduate school and raising three boys—Cheryl experienced challenges and eventually uncovered the secrets to a life of abundance and vibrancy. Today, as a global thought leader and entrepreneur, Cheryl guides high-level executives, entrepreneurs, professionals, and stay-at-home moms in activating their potential—inspiring them to greater personal and professional fulfillment. Her clients include individuals and corporations such as the Singapore Government, BP Lubricants Asia Pacific, Maybank, Royal Plaza on Scotts, Deutsche Bank, Bloomberg, and the Estee Lauder Group. In 2011, she was honored with the distinguished Global HR Excellence Award by the World HRD Congress. Discover the Essentials to Building a Profitable and Fulfilling Career/Business Without Compromising Your Lifestyle. Get access to SUCCESS CATALYSTS to discover how you can thrive in your business/career and without compromising living a life you love.....An Excellent Life.